with the motorized amphibian vehicle. Hovercraft mini is a fully amphibious air cushion vehicle designed and built especially for pilots weighing up to 55 kg (121 lbs). Small hovercraft is fully amphibious, it’s because vehicle can operate on land and water. And that’s not all, in winter time, it can operate on snow and ice. How about mud or grass? 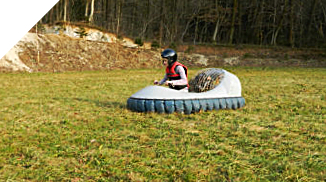 Mini hovercraft will fly over muddy fields as well as any other surface you can imagine. It is the ultimate all terrain vehicle in small version. Being easy to fly, fast to learn and safe to operate, hovercraft mini is ideal for anything from hovercraft rentals, kids birthday parties, outdoor public events, etc. Hovercraft mini is available in a DIY (do it your self kit) for father - kid garage projects or as a turn-key and fully functional hovercraft. And yes - it is for boys and girls! It’s safe and it’s fun. Hovercraft mini is 1 person mini sized hovercraft, ideal for personal use or rental (birthday parties, events,..) in theme parks or elsewhere. And yes, it is fully amphibious vehicle. With a child on board as pilot, hovercraft is not meant for open waters use, but always use hovercraft in shallow waters where you can ensure kid’s safety. Life jacket is a ‘’must’’ when operating on any water surface. Hovercraft engine is installed under the strong stainless fan guard with deep dome, so hands or fingers can not reach a dangerous rotating or hot parts. Steering system is made of 3 aerodynamic rudders giving hovercraft ultimate control in turning left, right or rotating. Hovercraft has installed ‘’kill motor’’ switch, that must be attached on pilot’s hand. In case pilot falls out of the hovercraft, hovercraft stops. There is also second security remote kill motor switch, that stops hovercraft motor on distance. This control device must be in hand of a parent or a supervisor where hovercraft are used in rental to insure maximum safety for pilot and other people nearby watching. Throttle control like on motor bike - twist grip, as well stainless steering works same as on standard bicycle. Bottom of cockpit has attached anti-slip material so hull is not slippery. Overall hovercraft hull length: 215 cm Overall hovercraft hull width: 120 cm Maximum hovercraft hull height: 68 cm Total weight: about 50 kg Fuel tank capacity: 3 lit Flotation: sandwich surf bottom, hovercraft itself can not sink Min. recommended pilot weight: 25 kg Max. recommended driver weight: 55 kg Max. recommended speed: 25km/h Engines HIRTH F36, F33 (range 15hp - 28hp) Note: Top speed of a hovercraft can be off course much higher than max. recommended speed is. As well top speed can be adjusted any time, with number and angle of impeller blades inside the duct. On request, hovercraft have installed extra remote ‘’kill motor switch’’ that stops the motor on distance by simple press on the button. • Helmet - always wear helmet! • Life jacket when operating on water. • Eye and ear protection (quality helmet will do the job perfectly) • Adult person supervision when pilot are kids.